The craft on display in Steve James’s new film Abacus: Small Enough to Jail is so sturdy and comforting that the experience of watching it almost feels like a hug. James doesn’t upend the form or bend the rules of nonfiction filmmaking in this brisk, mostly past-tense retelling of the unlikely circumstances that led to a small, Chinatown-based, family-owned bank being the only institution in the U.S. charged with crimes related to the 2008 financial meltdown. He keeps his aesthetic house clean and uncluttered. And why shouldn’t he when he’s got a ripping yarn already drenched in cascading ironies, a set of memorable characters, and a new vantage point from which to view one of the central historical events of recent times? It’s now been seven years since Inside Job, and I can’t remember a single frame of that film, but I have a hunch the people in Abacus will be rattling around in my skull for a long while. We might debate for a time whether nonfiction filmmaking is best marshaled at the service of stories and characters as opposed to sensations and observations (and the degree to which those poles need be opposed), but over the course of a career that runs far deeper than just his 1994 groundbreaker Hoop Dreams, James has continually given classical documentary storytelling a good name. Due to the long shadow cast by his lengthy basketball epic and the acclaim generated by his mid-career highlight The Interrupters (2011), he’s mostly been regarded as one of our premier longform vérité filmmakers. But digging into the less-discussed corners of his filmography turns up riches that don’t fit that easy categorization: Stevie (2002), his secret masterpiece, a self-lacerating examination of how life went wrong for his former mentee, one of the finest of all American documentaries; the wrenching, mostly interview-based testimonial of a death row chaplain, At the Death House Door (2008); No Crossover: The Trial of Allen Iverson (2010), a film that masquerades as a traditional sports doc before exploding into a fraught, also self-critical look at race in the Virginia town where both James and Iverson grew up; and, of course, his gentle ode to film and Roger Ebert, Life Itself (2014). Throughout his career, James has maintained a flexible tool kit of traditional doc techniques that he’s mixed and matched to suit his material. In this, and in his propensity to honestly open himself up to critique and record it, he’s something like the anti–Errol Morris. Though, like Morris, James does possess a set of core concerns that he rehearses again and again, almost obsessively. Sport may be what one thinks of first (Hoop Dreams, Prefontaine, No Crossover, Head Games), but competitive athletics are often just an engine for a body of work deeply concerned with the American experience of crime, community, race, and class. 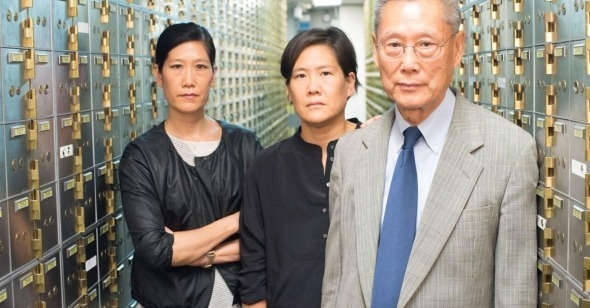 The five-year persecution of the Sung family also seems disproportionate given that Vera, Thomas’s daughter and director of the bank, immediately reported evidence of fraud when she first found out about it and fired those involved. Even though James does allow for the plausibility of the city’s argument—that there was no way for the bank’s upper echelons to not be aware of this wrongdoing—his film is clearly on the side of the Sungs throughout. From a genially deck-stacking opening in which Thomas and his wife Hwei-Lin grow misty-eyed during a viewing of that classic financial securities weepie It’s a Wonderful Life, to a recurring scene of the Sung paterfamilias and his fierce daughters strategizing loudly over a basement table at a Chinese restaurant, we’re aligned with this family, and by extension the community they serve, one that James fully establishes visually and via an unobtrusive score that incorporates Chinese instrumentation without ever feeling appropriative. For those James fans who just long to see the man follow a subject around in space, who decry any chaining of his camera for a sit-down interview, an early-film Chinatown walk-and-talk with Thomas offers some of that familiar magic. There’s one shot from here that stands out as particularly James-ian: Thomas, in the midst of introducing himself and how at home he feels in the bustle of Chinatown, interrupts his musings, points to the restaurant he’s passing and notes, “Incidentally, this is a very tasty noodle shop.” This aside has no real bearing on the story that’s about to unfold, but James still dutifully cuts into the kitchen of the restaurant so we can watch those noodles being made. They do look tasty. (The film will digress later into an extended familial debate over a sandwich, which proves as revealing of the Sung clan’s dynamics as any interview ever could.) Steve James is a filmmaker who seemingly never loses sight of where he is, and what’s important to film. Whether it’s Chicago, Hampton, Huntsville, Pomona, or, now, Chinatown, he’s firmly in place. While watching his films, we are too.